The Committee on Science, Engineering, Medicine, and Public Policy (COSEMPUP) is a joint unit of the National Academy of Sciences, National Academy of Engineering, and the National Academy of Medicine. Most of its members are current or former members of the Councils of the three institutions. COSEMPUP operates out of the Policy and Global Affairs division of the National Academies of Sciences, Engineering, and Medicine. COSEMPUP conducts studies on cross-cutting issues in science and technology policy. It was chartered by the Academies to address "the concerns and requests of the President's Science Advisor, the Director of the National Science Foundation, the Chair of the National Science Board, and heads of other federal research and development departments and agencies, and the Chairs of key science and technology-related committees of the Congress." It also monitors key developments in U.S. science and technology policy for the Academies' leadership. COSEMPUP studies are usually conducted by special interdisciplinary panels comprising the nation's best scientific and engineering expertise. While many studies are sponsored by government agencies, COSEMPUP procedures safeguard its studies from the influence of sponsors or other outside groups. 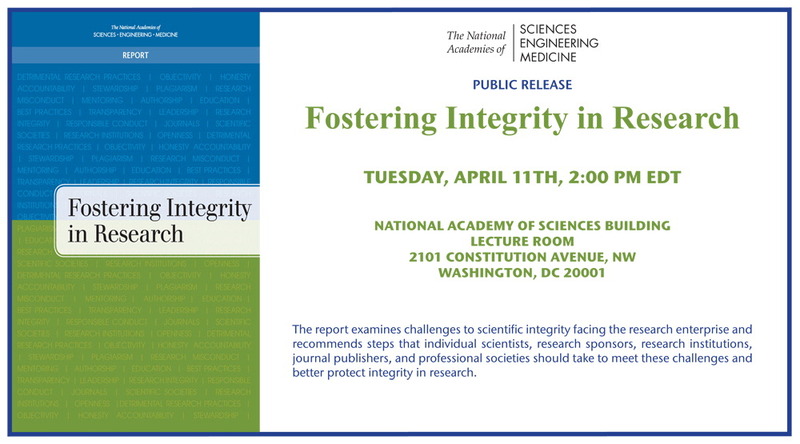 The Committee on Responsible Science, chaired by Dr. Robert Nerem, released its final report, Fostering Integrity in Research on Tuesday, April 11, 2017. The report examines challenges to scientific integrity facing the research enterprise and recommends steps that individual scientists, research sponsors, research institutions, journal publishers, and professional societies should take to meet these challenges and better protect integrity in research. The Arc of the Academic Research Career is the summary of a workshop convened to examine major points of strain in academic research careers from the point of view of both the faculty members and the institutions. National experts from a variety of disciplines and institutions discussed practices and strategies already in use on various campuses and identified issues as yet not effectively addressed. This workshop summary addresses the challenges universities face, from nurturing the talent of future faculty members to managing their progress through all the stages of their careers to finding the best use of their skills as their work winds down.